Build a Budget for your Bucket List! 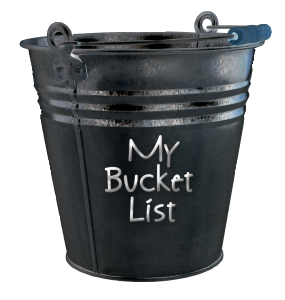 Do you have a bucket list that you made years ago and stashed away in a drawer some where? Do you have a list of things that you want to do before you die? Do you dream of achieving your goals when you are on the subway or sitting in traffic? I sure do and I have a very healthy habit of re-doing my bucket list or goals list every year and allocating money to make sure that each year- and you should too. So far, I’ve accomplished a ton of items. Here is a list of some of my big bucket list successes! Travelled throughout Europe including driving down the Adriatic coast, partying through the Greek islands, and taking my family on a Christmas trip to Vegas, Egypt, Hawaii and more to come! My secret to success is to support each of your goals with budgets and a “to do list”. I achieve as many items on my bucket list as I can and this is how I do it. 2. Review all of the items and then pace a 1, 2 or 3 beside each item making the “1’s” the post important to achieve, “2’s” the second most desirable, etc. 3. Take all of the “1’s” and think how much it would cost to achieve this goal. Would it take time away from work? Would you save the money or count on a new source of income to support yourself. Would you need to put your palace an airbnb.com to rent it out while you are gone? Maybe trade your place for a place where you want to travel to? Free, is free. 4. Write all of your expected expenses down, including keeping your current household running, if necessary and see how you can achieve that goal and what surplus or deficit it will take to make your goal happen. 5. Calculate how long you will need to save, what steps you would need to take to make additional income, or people you need to meet with or flights to book to make it all happen. Be sure to ask your bank if you have pre-paid you mortgage enough to take a payment holiday. This is another great way to get some financial relief that that you can take Nana back to the old country or climb a mountain you’ve always wanted to climb. Place a budget and next steps to your bucket list and achieve them ALL before you bucket is kicked. It takes your goals out of the closet and puts them within reach. I’m well on my way to achieving all of mine!